Plans to build a new theatre on a West End site where another playhouse was destroyed by fire have been approved by Westminster City Council. Westminster Theatre, which was based in a 250-year-old building, was so badly damaged in 2002 that it was demolished. Leading stars performed at the venue which opened more than 70 years ago. 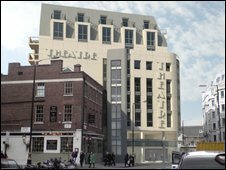 Now plans for a 314-seat theatre and a smaller cabaret stage, flats and a restaurant, at the site in Palace Street, have been given approval. The eight-storey building will have a Portland stone facade and will be run by theatre operator London Aloft. Planning committee chairman Councillor Robert Davis said: "The loss of this theatre was a sad day for the city, but I am confident these plans will give this historic site a new lease of life as a cultural hub in the heart of Victoria. "Theatre has helped shaped our city over centuries and forms the lifeblood of its cultural and entertainment offer which attracts visitors from around the world." Built as the Charlotte Chapel in 1766, the original building was altered to be used as a cinema in 1924 until being converted into a theatre in 1931.